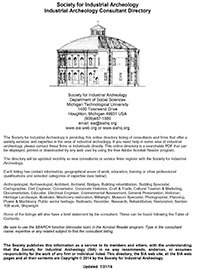 The Society for Industrial Archeology is providing this online directory listing of consultants and firms that offer a variety services and expertise in the area of industrial archeology. If you need help in some area of industrial archeology, please contact these firms or individuals directly. This online directory is a searchable PDF, that can be displayed, printed or downloaded by any web user by using the free Adobe Acrobat Reader program. The directory will be updated as new consultants or service firms register with the Society for Industrial Archeology. NOTE: You must use Acrobat Version 5.0 or later to display the Online directory correctly. Firms or individuals that wish to be listed in the directory must register online. Each individual listing can not be longer than 1 standard printed page. Note: You must be a current member of the Society for Industrial Archeology to be listed in the Consultant Directory. PLEASE NOTE: The Society for Industrial Archeology publishes the Industrial Archeology Consultant Directory as a service to its members and others, with the understanding that the Society for Industrial Archeology (SIA) in no way recommends, endorses, or assumes responsibility for the work of any firm or individual listed.